“Dog Walking” began as an inquiry from a collector. 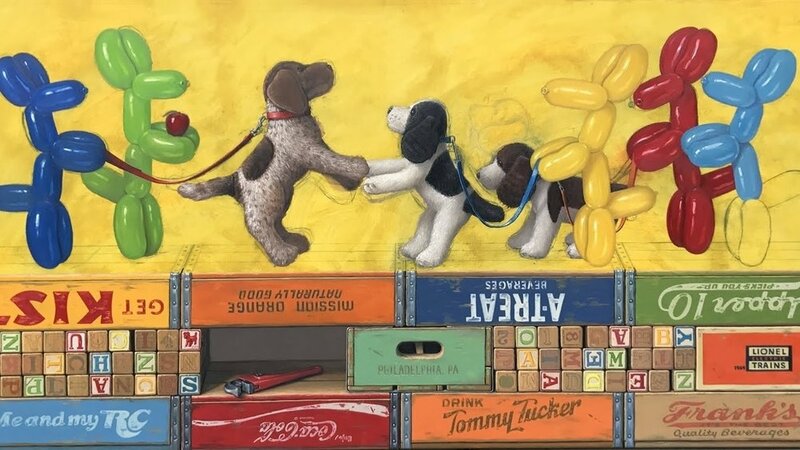 Having a rather large wall, he wanted something around 36” x 72.” Having seen a previous painting, “Pals,” with my dog Lucy and a stuffed animal Doppelgänger, he wondered if 3 dogs important to his family could be included. I tend to jot a bunch of ideas in a sketchbook and when it hit me, balloon dogs walking stuffed dogs I was hoping he couldn’t resist as I SO wanted to do it! I draw directly on my canvas, making changes as I go, and even the final painting can differ from this drawing. At this point, a big change is still evident… I had all three dogs jumping up excited to see each other… but the two dogs on the right mimicked each other too closely and I decided to drop down the back one on all four. Funny but I guess my initial sketch was correct! Once I’m relatively convinced of the drawing I coat it in yellow acrylic to seal it in and add a vibrance to the surface and begin painting quite directly. As you can see I almost finish areas before I move on. Slight touch ups may occur later but as a whole I work pretty directly. As this was a commission, there are plenty of “loved” ideas in here from the wrench to words on the crates and blocks. Though not wanting to make them so obvious I love to turn letters, change colors, and downright obscure to keep the painting functioning by itself. Here you see one of those after drawing changes, I decided to drop the right dog’s leash in front as opposed to obscuring the hind dog’s face. This shows something new that I have been doing. Digital technology has really changed things with how quickly and easily photographic processing has become. I can now take a quick shot with my phone, air drop it to my laptop that rests beside my easel, and print the image on my printer. If I was a little more adept I’m sure I’d be doing all this on my computer without this print step but I suppose I’m pretty tactile being an artist. Once the image is printed out, I can doodle on it with colored pencils to figure out exactly what color balloon dog should be where, the color of leashes, etc… Thus, here we see one of these images that I saved (medium would be computer ink printer and colored pencils. These hand colored prints let me check my initial impulses as I also use colored pencils in the sketch book drawings, but vibrancy really changes a lot once I switch to oils. So, as you can see, almost every balloon changed colors from the initial drawing (but I suppose so did many of the crates). For me, I do spend a considerable time thinking about color arrangement. It is a really integral part of my artwork, not only letting the composition dictate how ones eyes dance around a canvas, but also letting colors with their vibrancy and hues pull the viewer in directions. With the use of these soda crates with their primary and secondary blocks of color, maybe I was forced into that. My sketchbooks are my references. Even these printouts get glued onto a page for referral as I work. Now the balloon dogs on the canvas are painted according to the color scheme of the printer sketch. The wall shadows really become part of the figures in the painting, They almost become characters in the parade also. As you can see, the background always changes things dramatically, to me it finally brings the characters into reality and their space. Taking a break, hanging the painting on the wall, and watching some golf. Almost there, only one crate top left to go! Completed painting and a moment to stand with it, kind of looks like I picked my shirt to mimic the balloon dog closest to me. Actually, wanted to show myself it in to give sense of size. Numbers on a computer screen mean very little to people in trying to visualize dimensions, but next to me they make sense. Final home, conference room in a commercial location - thrilled with this shot. Looks way better than on my paint spattered easel!